PCManFM-Mod adds user-definable commands, other features, and important bugfixes to the legacy version of the PCManFM file manager v0.5.2. This version installs as “pcmanfm-mod” and will run independently of other versions of PCManFM you have installed on your system. This legacy version is still desired by some due to more stability than the newer 0.9 rewrite in progress, less Gnome dependencies, and the optional use of HAL rather than gnome-vfs for mounting. PCManFM v0.5.2 has no user-definable functions. This mod adds five user-definable commands to the right-click and Tools menus (and keys F4, F6-F9). The menu names, icons, and commands are derived from .desktop files. When run, all selected files are passed to the command. In this way, you can easily modify the command names, functions, and icons, and have them run custom applications or scripts. For instructions, see the USAGE NOTES in the README. User command examples are also available below. This mod also adds many other features and addresses several serious bugs detailed in the README below. Tip: Since HAL is no longer used in newer distros, most users will want a -nohal package below or to build manually without HAL support per the README. For automounting drives, devmon works well with PCManFM-Mod. NOTE: If you install using a deb file and don’t use the PPA, please be sure to authenticate your download. Ubuntu 11.04 Natty Narwhal users will generally want to use a ‘nohal’ package. PCManFM-Mod built without HAL support means that HAL is not required, but pcmanfm-mod’s built-in volume management support will be disabled (you won’t be able to mount and unmount volumes within pcmanfm-mod, and volumes will not appear in the location side pane). You can use an automounting solution instead, such as devmon. Some prefer PCManFM-Mod without HAL either because they don’t have HAL installed (newer Ubuntu versions, etc), or because they don’t want the mounting features enabled. pcmanfm-mod-prov provides pcmanfm but conflicts with other versions of pcmanfm (as far as Pacman is concerned) (for LXDE users who want pcmanfm-mod to manage their desktop). pcmanfm-mod-nohal is like the pcmanfm-mod package, but built without HAL support and dependencies. With this package, you don’t need hal installed or running, but pcmanfm-mod’s built-in volume management support will be disabled (you won’t be able to mount and unmount volumes within pcmanfm-mod, and volumes will not appear in the location side pane). For other distros, PCManFM-Mod is generally very easy to build manually. Please see the BUILD INSTRUCTIONS in the README file below. independently of other versions of pcmanfm. 1)  Install required build dependencies. NOTE: gamin can be used instead of fam. will report anything missing when you run it as shown below. configure again before proceeding to make. unmount volumes), add --disable-hal to the configure command above. --with-preferable-sudo=gksudo to the configure command above. control pcmanfm(-mod) startup and desktop management. For additional information consult the README-LEGACY and INSTALL files. 1)  Install build dependencies (see BUILD INSTRUCTIONS above). 2)  Extract tarball and enter directory. The package files will appear in the parent directory. the script to adjust this). keys (for example, "User Co_mmand"). "Icon=" may be added if desired. files or they won't work. aterm, konsole, xterm, Eterm, lxterminal*, gnome-terminal*. single quotation marks (') in the command. in a terminal to see the output. itself. Pasting a folder into a selected folder no longer works. makefiles changed to build and install as "pcmanfm-mod"
changed Tools menu "Open Terminal" to "Open _Terminal"
This example uses repic to resize all selected files (repic must be installed before doing the following). Now when you right-click on a file or files in PCManFM-Mod, the Resize Pics command will appear. Selecting this command will start repic, which will ask you for the desired size to resize to, and other options. In this way you can resize a group of pics to any size, add them to an email, and control the specifics of how repic will handle the images. permz provides a fast way to manage file permissions in PCManFM-Mod. Just install it and associate it with one of the user commands in the same way repic was done in the example above. permz can be run as root (if you run PCManFM-Mod as root), as well as a normal user. xtract provides a fast way to extract archives in PCManFM-Mod. Just install it and associate it with one of the user commands in the same way repic was done in the example above. Alternatively, instead of using a user command, you can just make xtract the default application for archives. By using a chooser script, you can extend the five user-definable commands which PCManFM-Mod includes to perform an almost unlimited number of functions. This example uses a chooser script to ask the user what is to be done with the selected files. 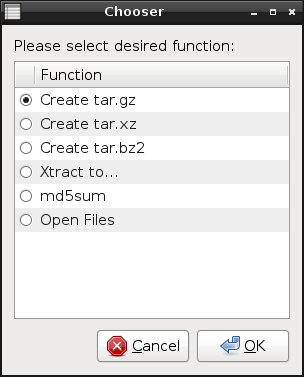 The example chooser script can create tar.gz, tar.xz, and tar.bz2 archives containing all the selected files and folders, can use Xtract to extract archives, calculate the md5sum of selected files, or can simply open all the files with xdg-open. The example chooser script is intended to be customized with any additional functions you want to add. First, install the example chooser script following the standard Script Installation Instructions. Now when you right-click on a selected group of files and/or folders in PCManFM and select the Chooser command, chooser will run and ask you what function to perform. If you select to create an archive, you will first be asked for the archive name. The AUR pcmanfm-mod does not provide or conflict with pcmanfm. pcmanfm-mod-prov is particularly useful for LXDE users, where LXDE needs /usr/bin/pcmanfm for desktop management. thanks a lot for this mod, the custom commands its a must for me. I used KDE and had a lot of scripts via “service menu’s”, so now that I’m using lxde, I was missing a lot custom scripts. IMHO it would be cleaner, and the context menu would be less cluttered if you put the run and the custom commands on a “Action” or “Run” sub menu or something like that, just as you did with “Open with”. The draw back would be that you’ll have to move more the mouse to get to them. And the feature request would be add a Trash Can support like on pcmanfm used in lubuntu. I previouslly used lxde with other distro but quited because it didn’t have a Trash bin (I had a couple of problems with this deleting files by mistake. (I read the author was against this and didn’t see the point in a Trash bin, but I prefer to have a “delete buffer” just in case of mistakes by me or by other users of my pc). I’ve managed to add a Move to trash user command using a modified version of the volume aware script posted here: http://ubuntuforums.org/showthread.php?t=124137 (I modified trash dir locations: $HOME/.local/share/Trash/files instead of $HOME/.Trash and “$mp”/.Trash-$UID/files instead of “$mp”/.Trash-$USER). But it would be nice to be able to have the Trash Can on the “Locations” so you can Empty it from there and even better to directly move to trash without having to use a custom command to do it (and maybe used the Shift if you want to delete it directly). Thanks for your feedback. The context menu is a little busy, but as you say it’s handy not to have to go into a submenu. If I put anything in a submenu I think it would be some of the special paste and copy commands. I don’t have any plans to add trash support, but as you say that can be done with custom commands – thanks for sharing the volume aware script. but, why does it say pkgs are available for ubuntu, debian, and fedora? Thanks – pkgs are available (from here) for Arch Linux only; PCManFM-Mod has been successfully tested on the distributions listed (for those and other dists you need to build it manually per the instructions in the README, which is fairly straightforward). UPDATE There are now Debian/Ubuntu deb packages available and a PPA. First of all THANK YOU for this great mod! Thanks for your feedback. If it’s not compiling without ––disable-hal, then you’re probably missing a required build dependency. If you or anyone determines what’s missing I’ll update the Ubuntu build info in the README. Other Ubuntu users didn’t report this problem building, but they may have already had the missing dependency installed. Seems to be a configure bug. which should be equivalent to pressing F3. As for why the window won’t close with the usual Alt-F4 equivalent I can’t say. I’ll consider adding a Close button and/or key. Thanks for your feedback. Figured out a way to close it, just not the way I normally do. I was just surprised there wasn’t a built-in keyboard way (like escape). Is pattern select missing? Or filter by pattern? I tried F3 for this, but I can’t do anything to the find results beyond opening them or their folder. I’m looking to move the find results to a new folder. Thunar’s equivelant lets you use wild cards (ie, *arch*ind*) when selecting. Sorry, I have not used the Find Files function much, and the mod hasn’t changed any of that code [update: it has changed as of v1.2.0]. As far as I can see it does support pattern matching, but it does not appear to support copying the results. Oh well. I was initially hoping for pattern-select then used the find feature as a substitute. If find’s results were piped into a tab that acted like it were a directory that would be an awesome feature on any file-manager. Probably a pain to code, I suppose, especially given that some files would inevitably have the same file name. make: *** No rule to make target `ui/prefdlg.ui’, needed by `all-am’. Stop. Sorry – re-installed. Perfect – and I may modify the multi-chooser script to do audio conversions. Great work! As I was saying on the ArchLinux forum, I have a pretty massive chooser script at this point. In fact I just make all file types open with that, and it does what I want. I find that easier than dealing with mimetypes. It’s a good idea. PCManFM gets really messy when handling mimetypes. Lots of multiple entries and clearing them is a real faff. Yeah I’m going to take a look at building a debian package soon. In the meantime, it does build easily if you follow the steps in the README. You know, I tried to install this on SliTaz 3, but I didn’t get far. I had to specially install gnupg and fix it’s various issues so I could generate a public key I could upload to the keyserver. Which I admit was an unfun way to spend 30 minutes. So now I’m still stuck. You do know that the unrealircd people provide an md5 hash rather than encrypt their archives like you have? Do you know that the person that altered their code was one of the mirror server admins? I doubt this would be the case with code hosted by sourceforge or googlecode. What I’m saying is that most distros comes with a md5sum command, while most do not include gnupg. Another issue with your way has to do with when the key does not verifiying for whatever reason which makes it impossible to use the key. Maybe you should follow unrealircd example rather than be overly paranoid. I don’t believe I’m the only person with this issue. > You know, I tried to install this on SliTaz 3, but I didn’t get far. I had to specially install gnupg and fix it’s various issues so I could generate a public key I could upload to the keyserver. Which I admit was an unfun way to spend 30 minutes. Very unusual for a distro to not include gpg – I’ve never encountered that. At any rate, you don’t need a public key of your own to verify my signature- just gpg installed and my key. IMO gpg is worth learning, at least the basics. >gpg: There is no indication that the signature belongs to the owner. No problem there – the signature is good. The warning is merely telling you that gpg can’t verify who that key belongs to. That is why my instructions include visually verifying the key fingerprint with the one shown here. If the warning bothers you, there are various ways to silence the warning or to establish trust for that key, but it’s not required. As long you verify the key fingerprint when you first install my public key, and you get “Good signature”, then the source is authentic. But hashes are vulnerable to alteration. As for signatures, I don’t consider them paranoid, just good security practice. For those who want to verify the source (which I recommend), they are provided. Thanks for your feedback. If you have any other questions or problems verifying, just let me know. No, I was wrong and I apologise for going off on you. I was mistaking the compression type xz for some encryption via gnupg and I only discovered my mistake now. Fun way to start off hey? SliTaz is a minimalistic Linux built on BusyBox. In fact, it only has xz in it’s developmental version, so I had to pretty much install it myself. But that’s done and I’m trying to install it now – will let you know if I do. And installed. I did hit a slight snag with the xcb and cairomm dependancies, but otherwise it was smooth sailing compiling wise. how to add a button – cdrom – in the pcmanfm-mod, as in pcmanfm 0.9.7? To be able to mount and eject. Thank you. I’m not familiar with the cdrom button, but next time I take a look at pcmanfm 0.9.7 I’ll check that out. devmon works well with pcmanfm-mod for automounting CDs. For unmounting you can assign keyboard shortcuts or a user command to run devmon ––eject, or you can use pcmanfm-mod’s volume management (View|Side Pane|Location Pane), which requires hal. with lxde, I have installed pcmanfm-legacy, but it not put wallpaper automatically, then install pcmanfm-mod-prov,automatically it put wallpaper in my desktop, all work very good, only a details, pcmanfm-mod-prov not put icon in the panel, neither open since the panel. It open since icon desktop only. Hi, If you’re using lxpanel, you should be able to right-click on the panel icons and select “Application Launch Bar Settings”. That window should allow you to add PCManFM-Mod (usually its in the System Tools section). Hi, thank you, all very good. Refreshing on click on “refresh” otherwise wait several seconds. On the Desktop I am waiting much longer because there is no’refresh’ ??? What distro and distro version are you using? And are you using fam or gamin, and what version? pcmanfm-mod uses the fam or gamin server (either one – they are interchangeable) for that detection. One Slackware user let me know that he was having a problem with delayed detection on the new version of Slackware. You might try the alternative (if you’re using fam, try gamin, or vice versa), or check that the fam or gamin server is running properly. On aptosid, I’ve noted that fam occasionally locks up and pegs the one CPU at 100%, which also causes detection to stop. I haven’t modified any of the code that the legacy pcmanfm used in this area, but I’ll see if I can narrow the cause down before the next update. If you have any more feedback on the issue please let me know, and also include your distro. Thanks for your feedback. Distro is Slackware of course. I have using LXDE since the begining of 2010. Everything was OK till I upgraded distro to current.Up to 13.37. It’s a pity I don’t remember which moment. Slack have gamin package . In 13.1 too . I downgrade package gamin to earlier version too but problem don’t disapear. Delay differ and is from 3 to 5 seconds. Till yesterday there was another strange thing. Sometimes on the Desktop I had some bash scripts. some had suffix .sh and other not. After about hour uptime or sometimes more icons of that files without suffix change and mime to txt too. After that sometimes if I removed files from desktop they didn’t disapear and restart x solved the problem. /tmp, changed kernel to 2.6.39.1 , and icons on desktop stay unchanged till today but delay wasn’t fixed. However it seams shorter then before. No debug messages of course. > Everything was OK till I upgraded distro to current.Up to 13.37. That is exactly the problem another Slackware user reported (same Slackware versions, but he’s seeing a 25 second delay). He could not find a solution and downgraded to 13.1 for now. It sounds like Slackware 13.37 has a problem with its gamin setup, as this isn’t being reported on any other distros. Thanks for the report and if I learn anything more I’ll post a comment here. and in config file set pooling the file system every 15 sec. Hashing the poll line for filesystem that I use in gamin config file seems to solve problem . In 13.1 there was no such file and server running on default settings. How do you do this ‘Hashing the poll line for filesystem in gamin config’? Forget about what I said about compilation. There is a config file in /etc/gamin and there I ‘Hashed settings for my filesystem’. Can you please tell me what you changed in /etc/gamin/gaminrc ? Hope to get a reply soon? Hi, pcmanfm-mod-prov, not have trash, how can install the trash. When erase a file any, I see that free 10GB and after it following the same free 10GB. pcmanfm-mod does not have trash support built-in. You can set one of the user commands to copy files to the trash – see this comment for one user’s solution. It’s me the other Slackware user with the delay too. I never saw this problem in 13.1 until I did a fresh install of 13.37 then I saw a delay, moving, copying, pasting, drag or drop. Some times just a few seconds and many times on average around 15-30 secs. But every time without fail if you click the reload/refresh button on PCManFm-Mod you’d see things happen right away as they should. Anyone can see from that slackbuild that there is nothing there to cause any of this. Hi Ig, Could you drop the dependency of hal for pcmanfm-mod in AUR? It is optional you write on your blog. Or doe we lose some important functionality with that? Pcmanfm-mod is candidate for being included in a new release of archbang and no hal requirement is important. I couldn’t test this new AUR package because I don’t use Arch anymore, but it should work fine – let me know otherwise. I don’t directly support Arch Linux anymore – not practical since I don’t use it – but I have a script that creates the AUR packages so I still update those for convenience. Thanks, IgnorantGuru. for your work. Especially knowing how you feel about Arch!! Very much appreciated. The no hal package is great and builds ok. Sorry to have to tell that devmon is not doing what it should do: showing partitions and external hard drives. We are looking for the cause; probably as you mention in the devmon page consolekit is giving trouble. First a very big THANK YOU!! This my favorite file/directory manager after searching for a long time for it! However, This is THE filemanager for me! So Thanks again!! Thanks for your feedback – you have good timing. I’m coding some updates to pcmanfm-mod now, and doing some work on the detail columns is on the list. Not sure about the date format but I’ll look into it. May have to be a little patient but some good changes are on the way, including optional udisks support for non-hal builds which is already 75% working, and some updates to the volume manager features. Good work needs time, so take as much as you need! My suggestions are wishes only and as I’m *not* a programmer, I highly respect your grateful work and your effort!! Any willing to merge your code with the main application? The original author abandoned the legacy pcmanfm 0.5.2 and started working on a complete rewrite, which is now known as ‘pcmanfm’ (udisks, gvfs), and the legacy version (hal, no gvfs) has continued to be developed as ‘pcmanfm-mod’. A few of the mod ideas have been incorporated into the new pcmanfm, but he was unwilling to include others. With the next update, pcmanfm-mod should optionally support udisks (and a legacy hal build option for those who want to stick with hal), and will continue to not require gvfs. Hopefully some other dependencies will also be dropped, and some significant new features are being added. So for better or worse you can expect the ‘pcmanfm’ and ‘pcmanfm-mod’ projects to be separate forks from now on, with different dependencies and an increasingly different feature set. First of all, I want to thank you for your work on pcman, devmon and mplayer resume script. I’m happy pcmanfm mod user with just one question. pcmanfm-mod –desktop shows “My Documents” icon which is impossible to remove without modifying the source. Several threads on Arch and LXDE forums pointed that I should modify src/desktop/desktop.c (https://bbs.archlinux.org/viewtopic.php?id=49906), but I have no idea what to do with relevant part of code. Whathever modifications I make (eg. comment out those lines), pcman won’t build. I’d be very grateful if you could help me. It built okay without that but I didn’t test the result – should work. I’ve edited source and it builds whithout any errors, but segfaults on launch. Sorry – didn’t remove enough. I have revised my comment above showing the portion to remove. I think that will work but if it doesn’t let me know and I’ll give it a try. UPDATE: Working on the new version, I discovered that the above change to remove My Documents will cause a hang if you right-click on a blank area of the desktop (for the menu). This icon will be removed in newer versions. Until then, I don’t recommend this hack. And when fluxbox starting, pcmanfm-mod does not run in the background, as in a normal window.Option does not work — desktop? The ––desktop option has no function in pcmanfm-mod – it is provided but ignored for compatibility with pcmanfm 0.9 and later. It is provided so that newer lxde scripts that pass ––desktop will work with pcmanfm-mod. To set pcmanfm-mod to manage the desktop, open Preferences|Desktop and check ‘Manage the desktop and show file icons’. 2. My Documents folder is not moved or deleted from the desktop. Maybe she’s not needed. I can make a symlink to my profile on the desktop and move it to anywhere on your desktop. 3. How to add opredellennye scripts? For example, in thunar you can add scripts from peazip. Maybe this will be implemented in future versions? 1. Currently, pcmanfm-mod does not automount volumes nor open a window when a device is inserted. This is planned for a future release. Until then, I recommend devmon for handling this. 2. This is a known problem and should be corrected with the next release. 3. I’m not familiar with those scripts specifically, but in general any custom command can be added to pcmanfm-mod following the instructions in the README file above. Also, pcmanfm-mod already has a facility for extracting archives. Hi IgnorantGuru and thank you for your work on this file manager. By double clicking on blank space of explorer window, you can move to the parent folder. and extension. You can select extension or entire file name by pressing F2 key. Moreover, you can edit the filename of next file or previous file by using down or up key. Please consider them and add them to your todo list if possible. Thanks – some good ideas there. I’ll consider them for the next release. I have never seen pcmanfm-mod produce a trash can icon – it may be gvfsd or something else creating that. Actually I’ve never even tried building it with the trash support, although I did see it in the code – thought it was just a stub. I’m no fan of trash so if I ever work on that it will certainly be optional. I also don’t have any intention of making gvfs a dependency – pcmanfm-mod has it’s own built-in vfs which I’ve been debugging for the last few years, and the new version will be using the same. Its stability and speed was one of the reasons I decided to continue development on this. The new version will be available for early testing shortly – I just have a handful of things left to do in the code (at least for a test version). Some good news: it looks like inotify support is now stable, so the new version will not require fam or gamin (as you know these were a source of problems). Also no hal (optional udisks instead). fam, gamin, and hal support should still be retained for those who want them, but they will no longer be default build options. I’m turning back to pcmanfm after this. Is there any chance to get this fixed, because I find it misleading not to be able to distinguish links from real files/folders on the Desktop. Hi, thanks for pointing this out. pcmanfm-mod is no longer in active development so this may not be addressed quickly, but I have noted it for any future release. spacefm also inherited this behavior so I’ve made a note to look at it – it will likely be changed there first. Yours is the first comment I’ve ever received on this and I never noticed it, but I agree it would be better as you suggest. fyi this is now included in SpaceFM – I think introduced in 0.8.7. If not then 0.9.0 will have it, along with some significant dm improvements. Hi, At home, I have Linux Mint XFCE with stock pcmanfm which supports Ctrl-1 and Ctrl-2. Ctrl-1 changes the folder view to a icon view and Ctrl-2 changes the folder view to a detailed list view. Is there a way to get this feature in PCManFM-Mod. I am using Salix OS on my work laptop and installed PCManFM-Mod on it.